New Scooby-Doo! DVD to check out! If ever we had mystery to be solved, our first call would always be Scooby-Doo and his friends, those pesky kids! So we’re pretty excited because Scooby-Doo! is finally back with a brand new series of adventures in Scooby-Doo! Mystery Inc – Vol.1. Out on DVD from 29th August, the mystery-solving gang end up at Crystal Cover, a village with a long history of frights such as ghost sightings, mischievous poltergeists, demonic possessions and other creepy coincidences. When Scooby and the Mystery Inc team arrive to prove these happenings are of a far less ghastly nature, the village rejoices – until the gang uncovers a creepier complication that threatens to change everything. Scooby-Doo! 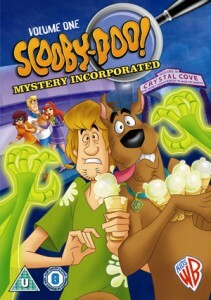 Mystery Inc – Vol.1 is a great DVD to get for any Scooby-Doo fan and also for people new to the series too! Scooby-Doo! Mystery Inc – Vol. 1 is available on DVD from 29th August, 2011 courtesy of Warner Home Video.